The BHF-BANK (Switzerland) Ltd. is a wholly owned subsidiary of the BHF-BANK Aktiengesellschaft in Frankfurt/Main. The company was founded in 1974 and its headquarters are in Zurich. It devotes its particular attention to investment consultancy and administration as well as to financial planning for a demanding, international private clientele. In addition, its field of responsibilities includes financial investment consulting and management in the corporate sector and the underwriting business on the Swiss capital market. The endeavour of the bank to meet high standards is based on a business policy principle which applies to all the companies of the BHF-BANK (Switzerland) Ltd. : the combination of a properly understood conservative and responsible business philosophy with a decided future orientation, which can, for example, be seen in the use of the most modern analytical and consulting systems. 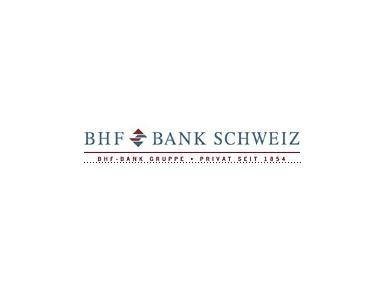 The BHF-BANK (Switzerland) Ltd. is registered with the FINMA and is subject to Swiss laws and practices. As a result it combines the high attraction of the Swiss financial location with comprehensive expertise in the administration of asset investments of international character.